Legendary parapsychology investigator and author GUY LYON PLAYFAIR was one of the original The Enfield Poltergeist investigators in the 1970s. He takes a look back at the spectacular case for The Spooky Isles. The Enfield poltergeist case of 1977-8 was the first of its kind to be witnessed and investigated by members of the Society for Psychical Research from start to finish. It was also one of the longest lasting, and provided examples of just about everything poltergeists have ever been reported to do, from raps on walls and floors and small objects whizzing around to pieces of furniture including a heavy sofa turning themselves upside down. And much more. There were the mysterious bass male voices that came out of the mouth of eleven-year-old Janet – or rather, as we discovered, from her false vocal folds (plica ventricularis). Many of their utterances seemed to have come from her subconscious, but some clearly did not, such as her/his account of how and where a previous occupant of the house died. There were incidents that violated everything we think know about the laws of physics: Janet levitating from her bed in full view of the lollipop lady across the road, a large cushion appearing on the roof of the house in equally full view of a local tradesman, a gas fire being literally ripped out of the wall into which it had been built, and perhaps the most baffling incident of the whole case – Janet describing how she had been teleported through the wall into the house next door. This became easier to believe when a book of hers was found by the neighbour in her bedroom. It too had gone through the wall. There was no conceivable normal explanation of how it got there. Indeed, there is no conceivable normal explanation of how poltergeists do anything that they do, and have been doing for hundreds of years. Not surprising, then, that some take the easy way out and simply pretend that there isn’t any evidence for them. A bizarre belief indeed to anybody who has had as much first-hand experience of them as I have. More bizarre opinions were to be heard on ITV’s This Morning on 6th February 2012 (Watch Video Clip Here) when I was glad to be reunited with Janet – now in her forties, happily married and living a long way from Enfield. It was one of the very few interviews she has ever given, and I was impressed by the way she gave a straightforward account of her experiences. I was less impressed by the inevitable sceptic who I understand Ofcom rules demand should always be on hand to deny anything people like me and Janet have to say. Duty debunker on this occasion was Deborah Hyde, editor of The Skeptic, who muttered something about the unreliability of memory and personal testimony (a complaint not often heard in courts of law where people are regularly banged up because jurors believe what witnesses say they remember) and tried to dismiss all the evidence with a wave of her magic wand. The evidence is still intact, however. There was enough testimony from at least thirty witnesses and a hundred plus hours of tape recordings to fill a book, and the book it filled – This House is Haunted – has now been updated and reissued from White Crow Books. Don’t read it in bed if you scare easily. GUY LYON PLAYFAIR spent 14 years in Brazil as a freelance journalist working for several British and American magazines, papers and agencies including Time, The Economist, and the Associated Press, and collecting material for his best-selling first book, The Flying Cow: Exploring the Psychic World of Brazil, recently reissued by White Crow Books together with three more of his 12 books – If This Be Magic: The Forgotten Power of Hypnosis, Twin Telepathy and This House is Haunted: The Amazing Inside Story of the Enfield Poltergeist. He now lives in London and is a council member of the Society for Psychical Research. 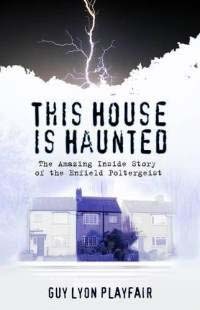 I have been fascinated by the Enfield poltergeist for a while, I have read the book, ”This house is haunted” and it gives a detailed insight of what went on. I have seen the interview on ”This morning” before and I wasn’t impressed with the skeptic either. They seem to ready to dismiss the possibly of a paranormal existence without reason, with out investigating the evidence. I too have been through what Janet did, though I didn’t speak in a gruff voice or levitate but I challenge any skeptic to spend a few nights in a haunted property, they will question their belief system.